I joined last month and this is my first challenge. I must say that I really love it, as I love challenges. I must say that it was a beautiful coincidence that the challenge was about cornmeal as my blog is about wheat free recipes. I loved all the recipes that Rachel listed and prepared, and I will try to make them someday soon. 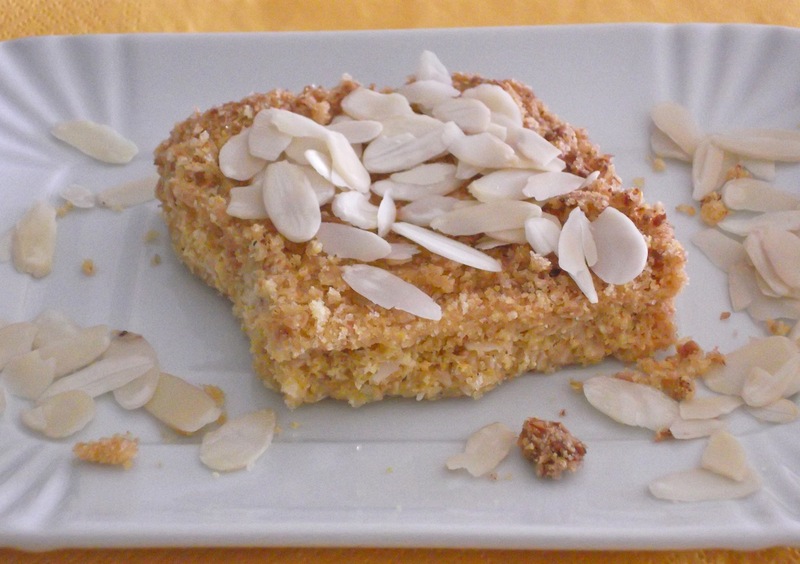 I prepared Sbrisolona, its an Italian cake and its’ origins are from the city of Mantova. You can say that is a crumble without the fruit. It’s delicious, crunchy, easy and quick to prepare. Today in Italy we celebrate Ferragosto, it’s like celebrating the end of summer. A Lot of people are on vacation and Milan is like a haunted city, EMPTY!!! I want to wish a happy Ferragosto to everyone! In a bowl mix with your hand the cornmeal, sugar, the chopped almonds and the zest. Add the butter and mix really well. Butter a stamp, and fill with the mixture. Spread and press with your hands. Bake it for 30 minutes at 180°C. 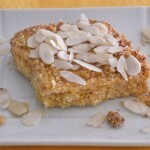 Once it has cooled decorate it with the sliced almonds or with icing sugar. Thank you Sawsan!Thumbs up for your blog and the beautiful recipes! A lot of your recipes bring back memories of some of the years I spent in Jeddah, I cherish those moments and I miss all the food. Thank you so much! I was wondering about the nioanotimn, I really couldn’t find anything about it, where di I find it? I saw your blog too and you have very interesting recipes too. Hello Conny, sorry for the late reply. I can’t understand what Nioanotimn is too. Please explain and I will try my best to help you.